Came up onto the Llangollen Canal through the four locks at Hurleston with the help of the ladie locky who is on duty at this busy flight. Now this is the second female lockie who has told me to stay on board while she locks me through, now i`m thinking is it my muscular manly looks that makes them rush to help or do they feel sorry for the old so & so struggling on his own....make your own minds up i know what i think well wish anyway. these two BW men arrived, now half hour is better than the 2 hrs i`ve waited on a road for the AA. Anyway as you can see they got down onto the back deck of "VALERIE" and prodded, pushed and pulled for a good 40 mins and up came a well water sodden log. The canals are on the whole a very pleasent enviroment to live and you get some nice people as neighbours so i thought you might to meet some i have shared the countryside with recently. Young chirpy, he`s just to the right of the bread looking over the edge of the back deck actually perched on the rope. He would hop up and knick a piece of bread and fly off then be back on the rope for a repeat performance. Enlarge pic for better view. Mr Mandarin Duck so posh and colourful, feel proud to have him as a neighbour. Mrs. Mooo & a few relatives checking me out as i move in to their neighborhood. 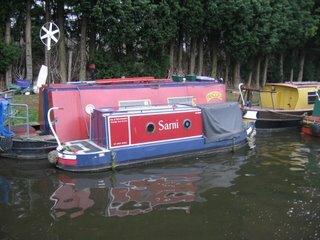 My friends Sue/Vic on NB No Problem have just bought a bigger boat and so the other is for sale. 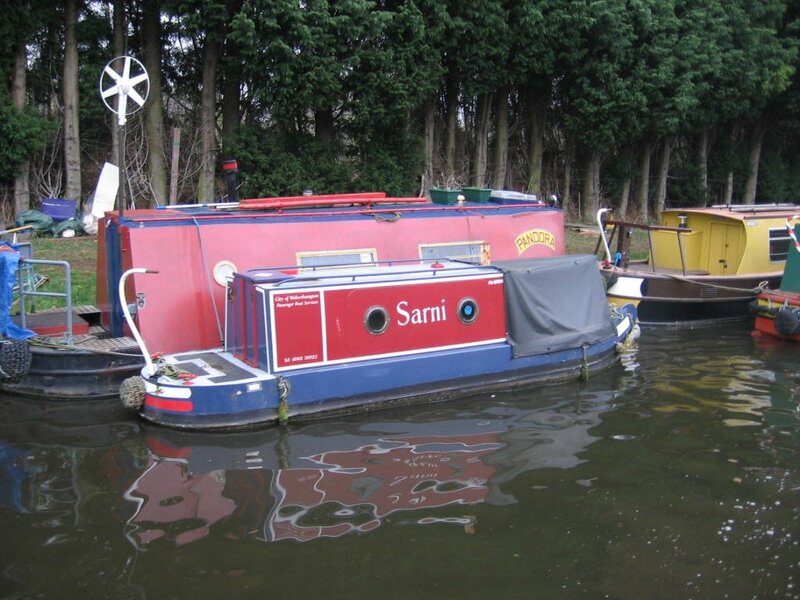 Check out the details on Sue`s blog and even if you don`t want a boat the blog is a good read. A couple of miles on from our night stop at the Anchor pub we came to this old chocolate factory, and it was from here that chocolate crumb was produced and loaded onto narrowboats to be taken to Cadbury`s at Bournville. When this prodution ended the factory produced only dried milk powder. Spent the whole Easter w`end at Nantwich just lazing in the amazingly good weather for a Bank holiday. Nice and handy for stocking up the freezer with the benifit of of a Morrisons S`market and a nice selection of shops. Treated myself to a canal painting by a local artist of a narrowboat at nearby Hassle Green, 22" x 17" framed and a bargain at £20 not a print but a pukka paint job. Will try and get a pic of it hanging in the boat. Below is the Crown Hotel in Nantwich, re-built in 1585 after a previouse coach inn on the site was destroyed in the great fire in 1583 that destroyed a large part of Nantwich. The other pic shows one of several Tudor style buildings in the town. The remains of Beeston Castle can be seen for miles before you reach it. Built in the 1220`s by Ranulf the Earl of Chester. It sits 500` high overlooking the cheshire plain. Henry lll used it as a garrison. Edward ll built more walls and strengthened the towers. It was occupied by both the Parlimentarians & Royalists during the civil war. It has a well of 370 feet that must have been ideal for long sieges. As you cruise along at such a slow pace without a care in the world it`s nice to observe the wildlife around. The Buzzards high in the sky hovering over the fields looking for a meal. A kingfisher flying past settling on a tree ahead and as the boat catches up off he goes to perch further on. I have been lucky enough to observe one diving into the water and catching a small fish. Ducklings are plentifull and the largest brood has been 13. Only today i witnessed nature in action when a duck with 6 babes was on the towpath and as they all waddled past a tree a crow came down from above and snatched a duckling. Perhaps this is the reason they have such large broods for they also lose some to Pike. Not much of a start in life attacked from above and below. Saw a baby lamb just born with mum licking it clean. Just waiting now for the cygnets to hatch this mum has 10 eggs in her nest. So a very good start weather wise to the year and long may it last. 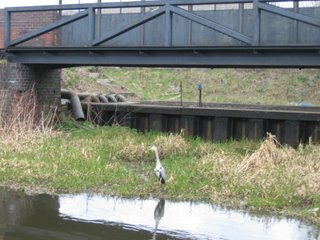 At this time we have started to cruise the Llangollen and Tina is becoming more nervouse by the day as we have to cross the Pontycylitte Aquaduct on this canal and at 130` high her fear of heights is worrying her. She will be fine with 3 men a cat and a dog to look after her. Hi Sandra, Tina is in good hands and thanks for the ginger cake, yum. We popped upto Chester for a few days before returning down the Shroppie and turning onto the Llangollen at Hurleston Jct. next to the reservoir of the same name that holds 80,000,000 of water that flows down the canal from the R. Dee up past Llangollen. Chester was not as nice as last time John & I visited back September time. We then had 6 very peaceful days but this time the yob element reared it`s head and at 3am Johns boat was set adrift and stones thrown at the boat so they could watch him get back to the mooring. The stones hit my boat and with Johns boat bumping into Tina/Andy we all were up. Still the kiddies had their fun on the way home from the clubs and no damage was done. Anyway in complete contrast i am sitting typing this out in the countryside with a lift bridge just ahead the doors are wide open and it is so peaceful. Moored for the night at Brewood and after a wash & brush we all went for a meal at the Bridge Inn next to bridge 14. 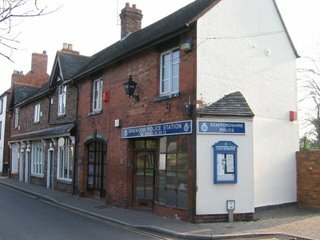 Brewood is small neat village that has everything shopwise from the village baker to it`s own police station with a butchers, small supermarket, bank & even a library in between. If only all our police stns. were as nice and only had to be as big as the Brewood Stn. On we go heading slowly for Chester as we wanted to avoid the Llangollen in the schools half term. Passing Wheaton Aston you notice how fairly straight this canal is with very few twists and turns. 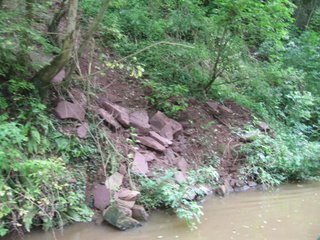 It seems that when this canal was built the intention was A-B as directly as possible and this shows at Cowley Cutting where the canal has been cut through solid rock. As you cruise through the sides rise steeply and there are signs of recent rock falls. 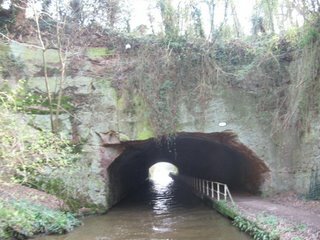 At the end of the cutting is Cowley Tunnell again cut through solid rock. 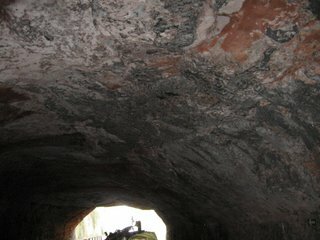 So as you cruise into this tunnell and look up there are no brick linings to be seen just the rock. Exiting the tunnel brings you to the village of Gnosall and 2 miles further Norbury Jct. the scene of a recent boat tradgedy when a couple in their mid 40s were killed on board by a carbon monoxide fumes from a poorly maintained gas water heater. Police tape is still evident as we pass. News, both good and bad travels fast on canals either by chatting to other boat crews as you pass through locks or internet sites such as www.narrowboatworld.com or www.towpathtalk.co.uk the latter is also in print and available in boat yards amongst other places. The Anchor at bridge 42 was a night stop. This pub is the size of a house, probably was in the past, and as you enter each side are 2 house size rooms each with open fires. The bar is about 10` long and passes through the dividing wall into each room. It has a couple of pumps on the bar but a lot of beer is served in jugs from the barrell. Scrumpy as well!! Leaving Gas St. Basin we take the Birmingham Level Main Line intending to branch off through the 3 lock flight at Smethwick onto the Wolverhampton Level. As we approached this jct. 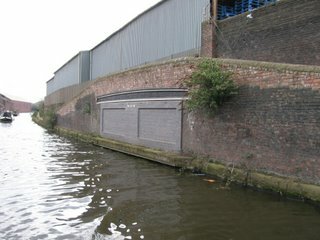 a large sign hung above "canal closed". This route would have run parralell but 20` above the Birm. Main Line and we would have turned sharp left and crossed over the Main Line through Oldbury Jct. 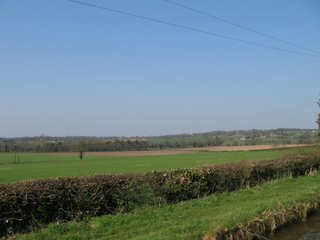 and on towards Tipton. 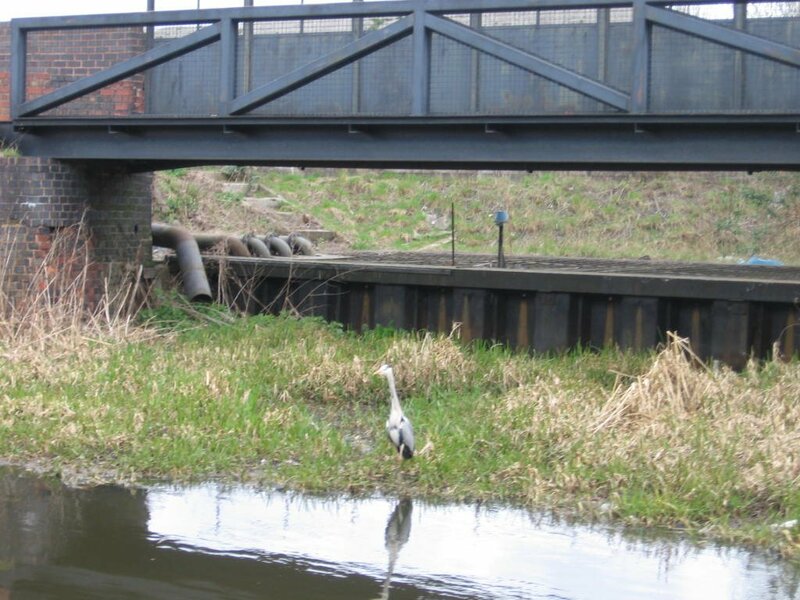 As the canal system around Brum is so vast we were able to take an alternative route. As we cruise we pass many bridges, some bricked up, that were once entrances to unloading docks for the many industrys of the past that are now empty sites or have been built on. We stopped off overnight at the Black Country museum as this is fenced off from the canal system and only accesable by boat or gates that our BW key will open. I covered Black Country Museum on my blog of Oct 3rd 2006. 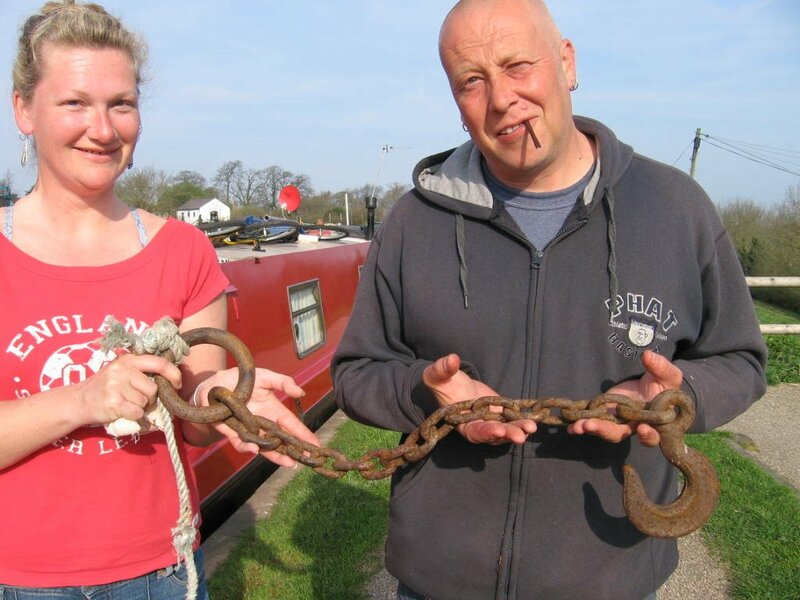 On the way Andy/Tina managed to get a very large chain & hook wrapped around their propeller that came with 4` of rope at no extra charge. Not long before this they also had a Sari around the prop. On the blog Jan 27th 06 are pics of Andys last propeller catch, a sleeping bag. Exiting the bottom lock brought us down on the Staffordshire & Worcestershire canal and and in just under a mile we passed through Autherly stop lock onto the Shropshire Union a drop of just 6". The lock like so many of such small differences in level came about to prevent one canal company taking water from another where their canals met. have been owned by one of Snow Whites 7 dwarfs. 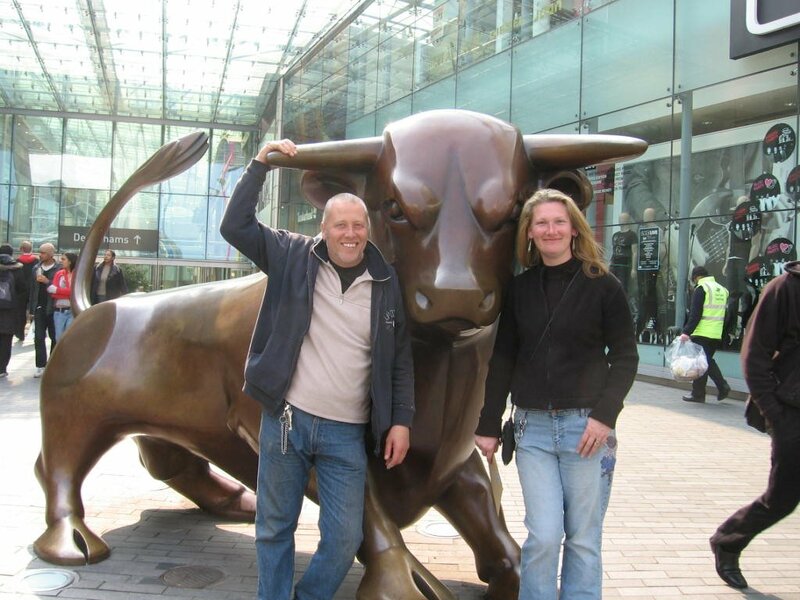 Andy/Tina posing outside the Bull Ring shopping centre. The city centre of Birmingham is noticebly litter free but that`s probably because all the rubbish goes in the canal but seriously well done Brummies nice clean streets. 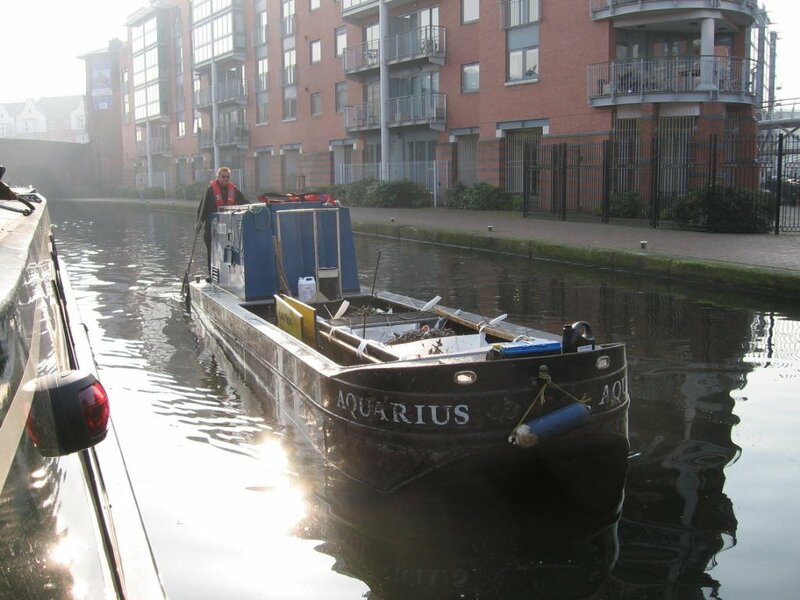 British Waterways doing their daily run clearing the floating rubbish in and around Gas St. Basin Pity they can`t do the same on the canals entering and leaving Brum as i think this is the worst city i`ve visited for rubbish. On our way in we even saw a 3 piece suite floating over a half mile stretch plus all the shopping trolleys and general rubbish. 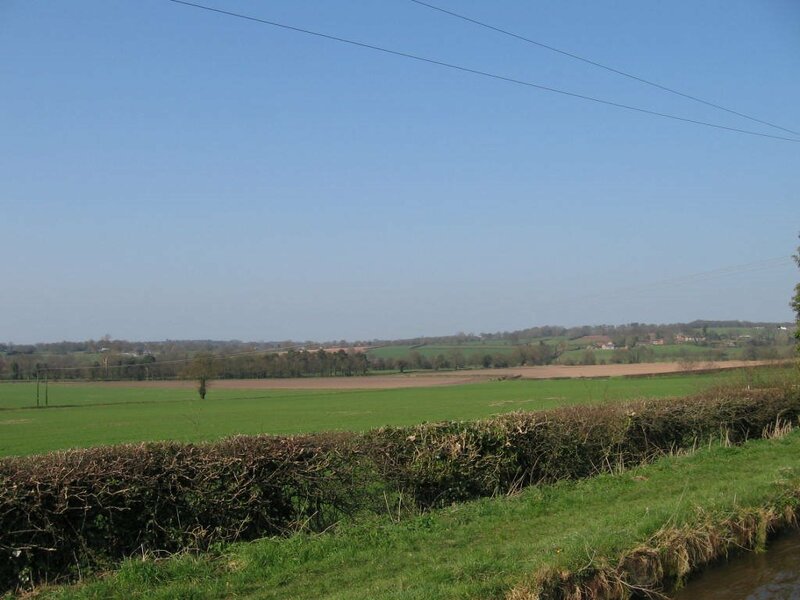 After the built up area of Birmingham it`s so nice to see some open countryside. 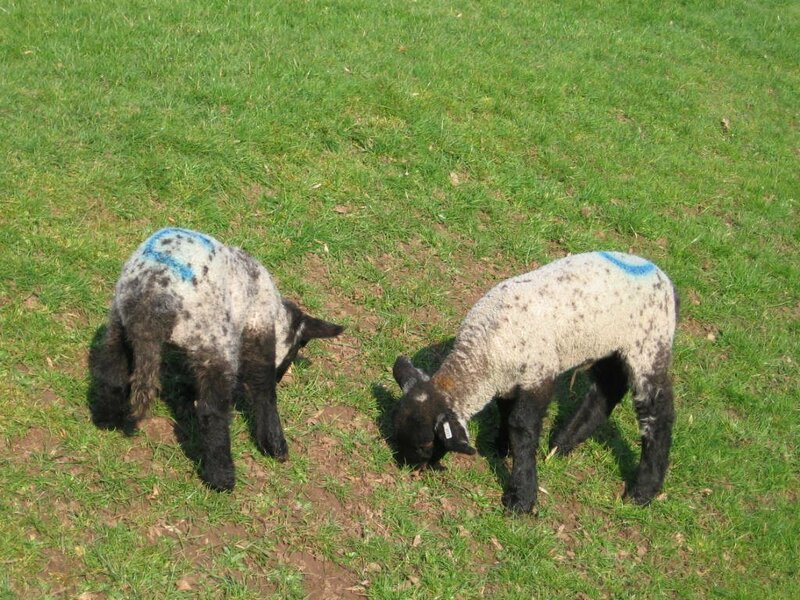 First chance i`ve had to get a pic of the lambs although they have been appearing in the fields for the last month.